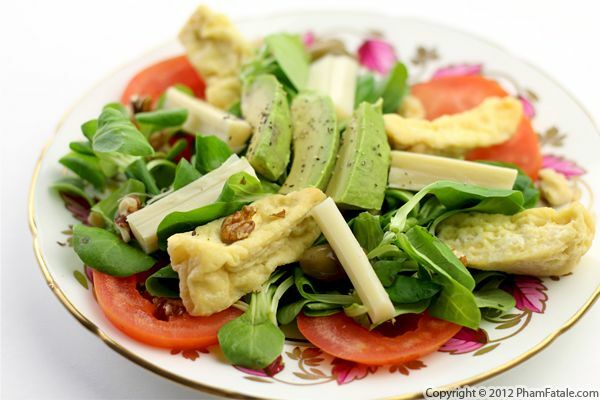 This salad is made with avocado, mâche, walnuts, deep-fried tofu, juicy tomatoes and hearts of palm. 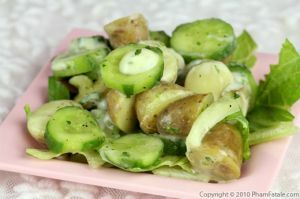 The dressing is very minimal; a drizzle of white balsamic vinegar, avocado oil and salt and pepper completes the salad. 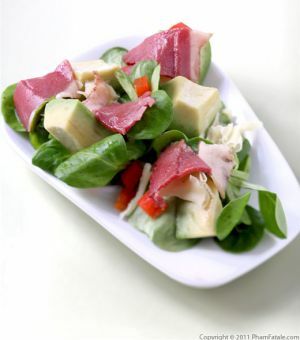 What better way is there to start a meal than with a healthy and tasty salad? Pickling the shallot: In a jar, combine the honey, 1 tablespoon balsamic vinegar and olive oil. Mix well. Add the shallot. Toss well and chill in the refrigerator for at least 10 minutes. Note: The longer you wait, the milder it tastes. You can keep it for up to 1 week in the refrigerator. Prepping the avocado: Slice the avocado in half, remove the pit. Using a mandoline or a sharp chef’s knife, slice the avocado into thick ribbons for a pretty presentation. Transfer to a plate, removing the peel from each slice (that way the avocado isn't mushy). 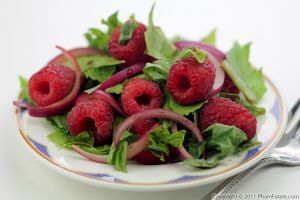 Cut the slices in half, lengthwise. 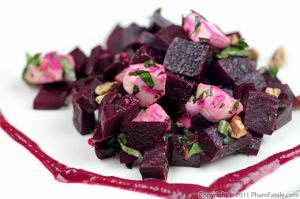 Drizzle with 1 tablespoon vinegar to avoid oxidation. 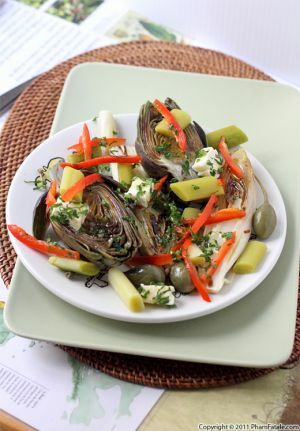 Place the greens, hearts of palm, tomatoes, tofu, olives and pickled shallot on a serving platter. Drizzle with the remaining vinegar and avocado oil. Top with 2-3 avocado slices at a time, fanning them. Sprinkle with chopped walnuts. Season with salt and pepper. Lightly toss without crushing the avocado slices too much. In place of the nuts, you could add pretzels to the salad for crunch. Mâche is also known as "lamb's ear lettuce" in the U.S. You can find it at Trader Joe's. Published By: Jacqueline Pham on May 10, 2012.